Every year on January 1 many of us enthusiastically jump out of the gate, flooding yoga studios and gyms only to find ourselves crawling back to the comfort of our cozy couch by month’s end. As a yoga teacher and trainer for over three decades, I’ve seen many New Year’s come and go. In the world of health and fitness, this time of the year is like the first day of school for adults. People are raring to go with new regimens, new journals, and a long list of goals and needed improvements. Year after year fitness centers and weight loss programs rely on our predictable routine of over-doing in December and purging in January, and they know just how to pull us in with the promises of “a new body and a new you for just pennies a day.” And we buy into it—big time—to the tune of billions of dollars spent on health and fitness-related products in January alone. It happens like clockwork. We bask in the freshness of a blank page and the possibility for real change. We make resolutions, big resolutions. We start and stop diets, make and break resolutions. We rise and fall in unison year after year. What if I told you there’s a better way to live? What if the freshness of a blank page that inspires us on January 1 was available all year round? What if every day—better yet, every moment—felt like New Year’s Day? I’m excited to tell you that it can. 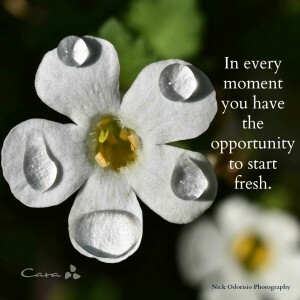 Every moment offers you an opportunity to start fresh. In every moment you can pause, settle your mind, and calm your nervous system. Pausing, even for a few breaths, opens you up to begin anew. Pausing allows you to clearly see exactly how you’re living, where you’re stuck or free, tense or relaxed, depleted or invigorated. In every moment you have the opportunity to let go of behaviors that drain you and embrace new attitudes and actions that energize you. Every moment can feel like New Year’s Day. This exercise couldn’t be easier. It’s a great way to notice if what you’re doing is either energizing or draining. Practicing throughout the day will remind you that you can make conscious choices about how you want to live your life. Let’s give it a try with this simple strategy called Embrace and Let Go. Bring your attention to the sound of your breath. Doing so will immediately relax you and begin the process of settling your mind and body. After five to ten breaths, open your eyes and sit quietly. Notice the sense of fresh energy in and around you. Don’t judge your experience. Make a mental note of any unhealthy habits or beliefs that came to mind during your short practice. Throughout the day, practice starting fresh over and over. You can do it in the chaos of your commute, in between meetings, or while waiting for the school bus to arrive. It is easier to pause to breathe and embrace and let go when you minimize distractions, but it’s not essential. I no longer buy into setting a lengthy list of New Year’s resolutions. For me it’s more effective and efficient to tune into my habits and beliefs every day through practices such as yoga and meditation and simple strategies like Embrace and Let Go. I also no longer feed the “new you” frenzy in my yoga classes. Instead, I tone down the hyper-eager New Year’s energy by offering students plenty of silence and stillness to settle down and put their resolutions in perspective. Every breath, every moment offers you the chance to wake up and consciously choose who you want to be and how you want to live. You don’t need to wait for the first of the year to do this. 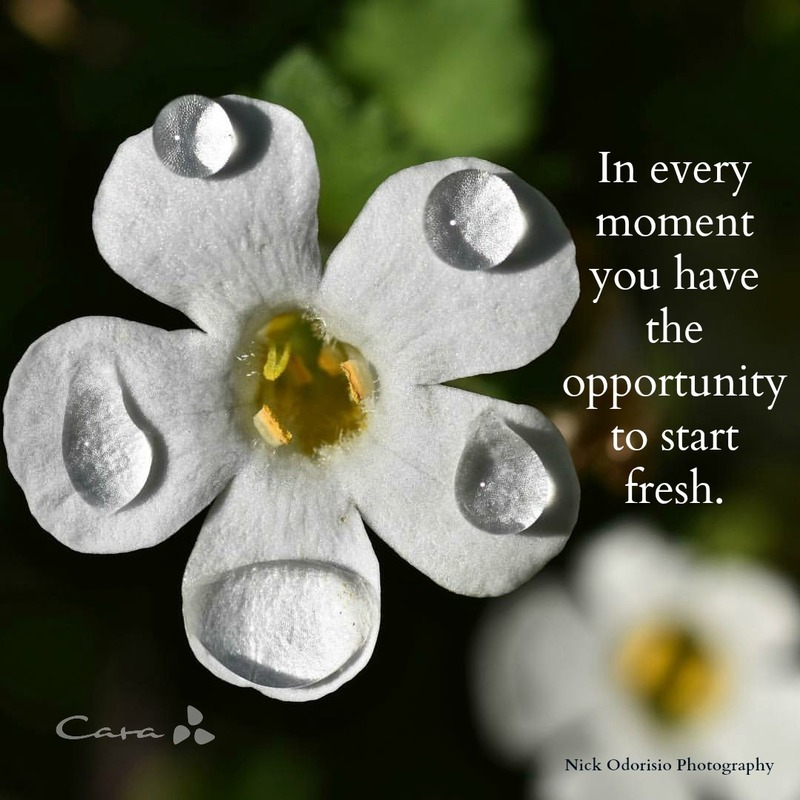 Each moment is a fresh palette from which you get to paint your life anew. Every breath is like a resolution to be empowered and energized. And every moment can feel like New Year’s Day.